Students participate in fundraiser to help Stony Brook Children’s Hospital's programs grow and better meet the health care needs of children. (L to R): Noelle Estrada, treasurer; Andrew Cerase, president; Ms. Randall; Mike Attard, SBU; Eric Nolasco, secretary; Elisa Ruoff, SBU; and Elmer Zavala, vice president. 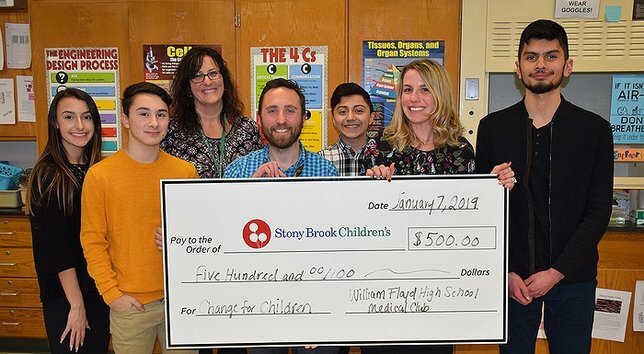 Mastic Beach, NY - January 28, 2019 - The William Floyd High School Medical Club, under the direction of club advisor and science educator Terri Randall, recently donated $500 to the Child Life Program at Stony Brook Children’s Hospital through the “Change for Children” program, which is a fundraiser designed to help the hospital’s programs grow and better meet the health care needs of children. Earlier this month, the Medical Club welcomed two representatives from Stony Brook Children’s Hospital, Michael Attard, a Child Life specialist, and Elisa Ruoff, a development officer, who shared a presentation about the Child Life Program and how they help kids and families cope, hope and heal during their stay at Stony Brook Children’s Hospital. Their goal is to make children feel comfortable and cared for during hospitalization, which is accomplished through their Child Life Program as it helps reduce the stress that pediatric patients and their families may experience when faced with illness, medical procedures and unfamiliar surroundings. At the conclusion of the presentation, the Medical Club presented their donation. Additionally, Medical Club members also have had the opportunity this year to learn about emergency medical technicians (EMTs) and the process of becoming one, as well as tour an ambulance thanks to Charles Voelger, Chief, Mastic Beach Ambulance Company. They also recently welcomed Colby Rowe, an outreach coordinator at Stony Brook University who specializes in “Stop the Bleed” training – bleeding control for the injured. Mr. Rowe brought representatives from Mastic Ambulance, Long Island Community Hospital’s Emergency Preparedness Unit and the Suffolk County Police Department, for the training. Click here to see what else the Medical Club is up to! Subject: LongIsland.com - Your Name sent you Article details of "William Floyd High School Medical Club Donates $500 to SBU Child Life Program"